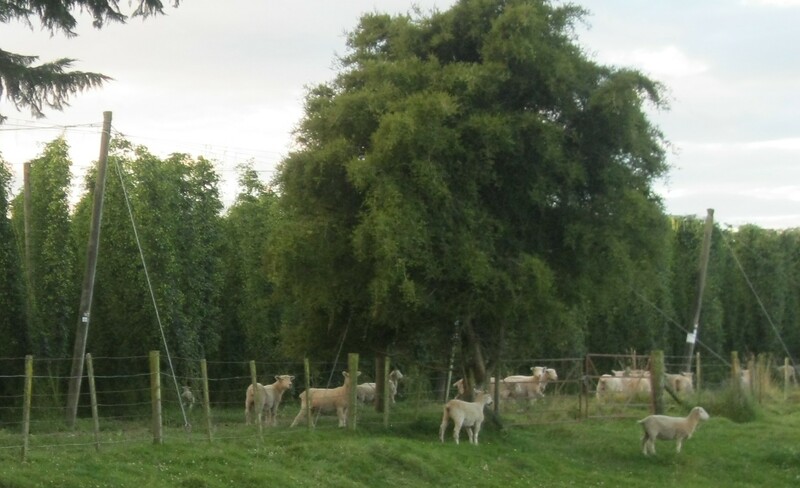 The goal of the grant project is to determine the feasibility of using sheep in an organic hop yard (farm) for pruning hop plants to help reduce the threat of downy mildew. Conventional hop yards use a chemical defoliant for this job. Hop plants grow very tall, about 20 feet up their supports. Once the plant reaches that height the farmers put the sheep into the hop yard. The sheep then prune/nibble the thick base of the plant and about four feet up the plant. This pruning creates openings and airflow at the base of the plant which in turns reduces the downy mildew pressure. When the sheep aren’t eating the hop plants or mowing between the rows they stay at Delight of Life Farm, most importantly that is their winter home. The idea for this project was first kindled when our New Farm Program group visited New Zealand, also on a 45th parallel and they grow many of the same crops there, cherries, apples and hops. We toured several hop yards, most of which employ sheep for the above purpose. That was an amazing trip and we learned so much. My grant participation mostly included providing a home for the ram and a wether (neutered male) for the non-freezing months of the year. The ram needs to be kept separate from the flock until it is time for breeding season which is usually in October. 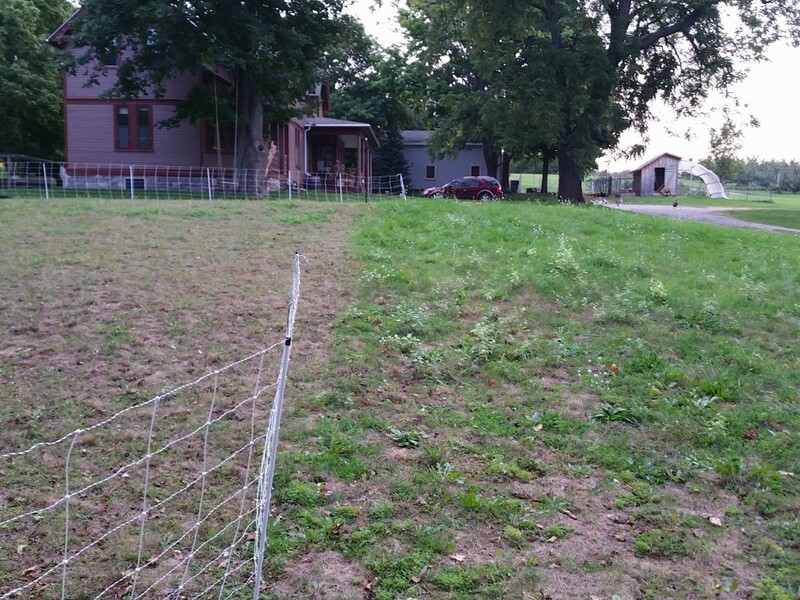 I have a small farm of two acres and two sheep fit just perfectly. It took a while but I learned how to move the sheep from place to place and I used them to mow down weeds, eat grass and even strip the leaves off of the ever-so-abundant poplar and black locust sprouts on my farm’s perimeter. During the summer of 2015 I was very successful with this method of moving them around that I only used about a dozen bales of hay during the six months that the sheep were here. I employed electric netting fence to make temporary and readily moveable pens for the sheep. I was very skeptical of this fence at first, but indeed it does work quite well. The fence was powered by solar batteries. After a while the sheep became use to the electric fence. I found they did not even challenge it. During the big storm of August 2015 several branches fell on the fence, shorting it out, but the sheep did not try to escape. To move the sheep from place to place I used a bucket of grain and just walked them to their new home. That part was very low tech! The sheep also did an efficient job of mowing the turf to a low level which then becomes the perfect place for my chickens, ducks and goose to free-range for food. On the left is the old pen and on the right is the new pen. Turf is overgrazed and low quality, but this was my first attempt. 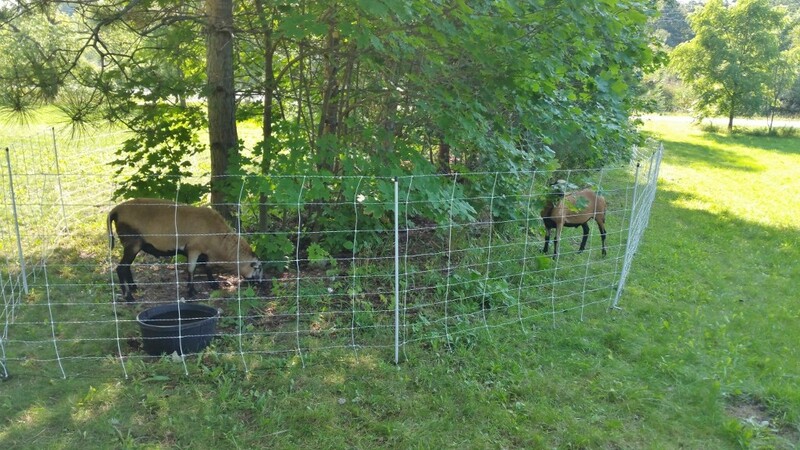 The electric temporary fencing also allowed me to have the sheep up close to the farmhouse which allowed my guests to interact with the sheep even more. Getting up close to animals and having time to observe them is a favorite activity for my guests, so many people never get to do that. 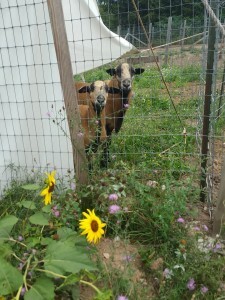 On October 16, 2014 I had a free public event here called “The Applebee” about 300 people attended and seeing and learning about the unusual sheep, that look like goats, was a highlight for many visitors. The sheep are gone now that it is winter time and my participation in the grant is over, but I learned a lot and am so glad to have had the experience. I am considering getting a pair of sheep of my own in the future, they were very good at eating weeds and keeping saplings in check. I also have really learned the value of small scale rotation of animals and crops. 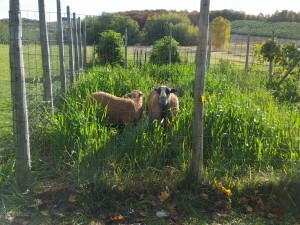 Pigs, sheep, geese, ducks, chickens are all rotated through my small fields and pens along with cover crops and garden crops. I do need to determine how to feed and house the sheep during the winter but I feel capable of determining a plan of action because of my hands-on experience. I’m also glad I have experience now with electric fencing. I will be able to expand on that knowledge as I continue my intensive and small scale farming here at Hillside Homestead. Here are the sheep eating some ‘accidental’ oats that germinated late in summer from mulched straw. I wish my friends, Amy and Brian, Heather and Chad, the best of luck in the future (post grant) with the sheep. As a historian I look at today’s world through the lens of the past. This sheep project is so exciting to me because it involves animals in the production of crops. It used to be common to use animals on a farm. In the not-too-distant past most farmers kept livestock. But today that is uncommon, large scale food crop growers do not usually keep livestock, especially livestock used for field work. I am anxious to see how my friends expand and grow the flock through breeding and how they manage to keep and feed the flock over the winter. I know the sheep do a great job in the hop yard, it is that darn, pesky winter time that can be a challenge. It was a good experience to work on a grant and I thank them for letting me be part of it. This entry was posted on Monday, December 7th, 2015 at 7:11 pm and is filed under Sheep. You can follow any responses to this entry through the RSS 2.0 feed. Both comments and pings are currently closed. 2 Responses to “Blackbelly Barbados Sheep and Hops” Comments are currently closed. Great article Susan and thank your very much for helping us out in this grant. We all certainly learned a great deal and had a fun time doing it. As a side note, we are still going to be raising sheep and want to grow the flock to at least 100 or as much as we need for the hopyard as well supplying some of our favorite local restaurants with product. Thanks for the kind words Brian. I think growing the flock is a great idea. I love seeing animals used for field work and of course as an important local food source.